Celestron is a big name in the world of telescopes. Does that expertise translate well into spotting scopes? 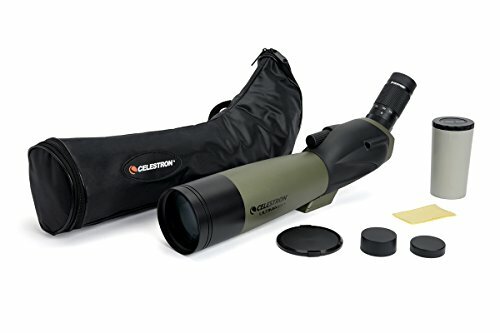 Check out this Celestron Ultima 80 review to find out. Out in the wild, whether you’re hunting or looking to sight that woodpecker or heron, you need a whole truck full of patience. It can take hours of waiting, sitting to get the result you want. The last thing you need is unreliable equipment. Particularly, you want optics to hand that won’t fail you when it matters. Celestron has a reputation for making great telescopes. 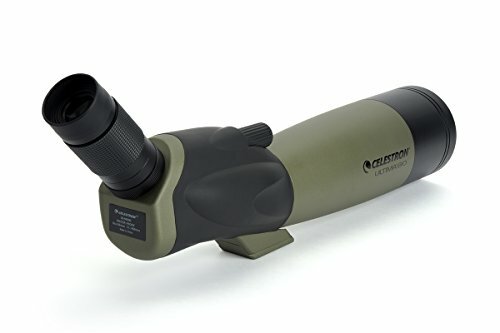 Does that translate here, is this Celestron spotting scope worth the price tag? Let’s find out. Is the Celestron Ultima 80 Really the Ultimate Spotting Scope? Celestron may have a good reputation for making telescopes, but the first thing you’ll notice looking at the box for the Celestron Ultima is the fact that its contents are pretty sparse. Where is the tripod or even a tripod adaptor? That is one trick that the company missed, like most, even those lower priced than this, have tabletop tripods. Putting that aside from now, you do get the standard adjustable magnification of 20x to 60x and a reasonably wide objective lens measuring 80mm. To really get to grips with whether the Celestron 5520 is worth your hard-earned cash or not though, we need to delve a little deeper and look at the main features and functions individually. As noted above, the Celestron Ultima 80 does feature a wide 80mm objective lens that offers the normal 20x to 60x magnification. However, another main downside is that while the image quality is superb at lower magnifications, it lessens as you increase the magnification over 25x. That being said, you do get reasonable eye relief of 18mm, meaning this scope is comfortable to use with or without glasses. Its field of view could be better though, at 20x magnification you have 105-feet from 1,000-yards and at 60x 52-feet from 1,000-yards. Don’t get us wrong, where it works well, it works really well, it’s just not what we’d expect for as illustrious a brand as Celestron. While it has multi-coated optics, they are not completely multi-coated. Thanks to the nitrogen filling in the barrel though, you do benefit from lenses that won’t fog up on you. Like many of the main features and components of this spotting scope, Celestron could have done more with the glass quality. Considering its many flaws, the light-gathering abilities of the Celestron are rather good. The image is clear and crisp, even in low light conditions, without any ghosting or haloing. The problem, as is a running theme with this model, is when you try to increase the magnification and zoom past 25x, then you start seeing some haloing, particularly if you are participating in some backyard astronomy and stargazing. However, on a range and when hunting, it will provide you a clear and bright enough image to place your shots accurately. There are red and blue circles that appear around the black holes, but this is more a nuisance than a serious problem. Recommended Reading: Don’t miss our guide to the top scopes of the year! Although the housing, which is rubber-coated, does provide adequate protection against minor use and abuse, it’s not the hardiest or toughest scope we’ve come across. The Bushnell Trophy, which is lower in price, offers greater protection. While it does not come with a tripod adaptor, the housing does feature a tripod socket and the scope itself is camera-adaptable. So, if you want to use it in conjunction with your DSLR, you can. However, the adaptor to connect the scope to your camera does not come with the scope. One of the major positives of the Celestron we found when putting this Celestron Ultima 80 review together was that it is actually incredibly easy to use. The eyepiece is angled at 45-degrees making it comfortable enough to use, while the focus and zoom knobs are positioned in a very convenient position and can be adjusted smoothly. A great addition to the scope is the sight tube for targeting quickly. It means you can target using just your eye and then pan to tweak your accuracy. 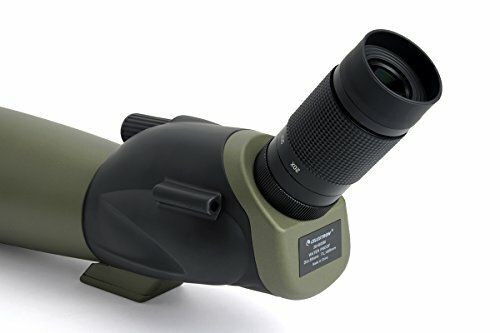 Although the optics could be coated with more layers, and it may not be the most rugged-looking spotting scope on the market, the Celestron 52250 will cope considerably well with a lot of rough and tumble. Even if it doesn’t, Celestron has a great value limited lifetime warranty on it that makes it a great investment. It was already touched upon slightly, but the chamber for the lens is also fog and waterproof, so you can use it in less than favorable conditions without worry. 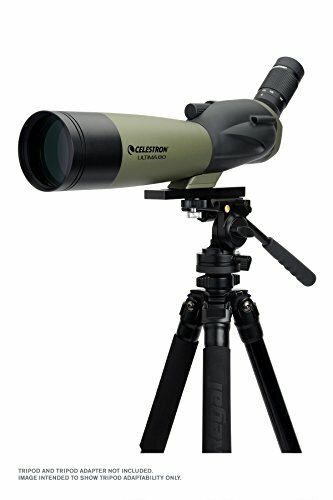 Well, clever name aside, this particular Celestron scope, as our own and many other Celestron Spotting Scope reviews show, is a mixed bag. On one hand, it has a reasonably wide objective lens and the expected magnification. However, given the higher price tag, the fact that this does not perform well when you are focusing on closer objects and targets is a major negative. That in combination with the lack of accessories and even a tripod mount, make this a less than cost-effective purchase. The final decision will always be yours, but you really need to give it some serious thought. The housing provides a good level of protection for the components, but as has been mentioned a number of times throughout the review, if you’re looking to use the scope only at a low magnification, it’s a good choice. However, if you are looking for a scope that will provide a clear and sharp image at higher magnifications, specifically higher than 25x, this will struggle to meet your needs. Beginners will appreciate the fact that this, like many other Celestron spotting scopes, is relatively easy to use. There are no complicated settings or controls, just a couple of dials. Hopefully, we have been able to give you a clear and balanced view so that you can make the education decision about whether the Celestron Ultima is for you or not.